Flooding in the Northeast has increased drastically due to the three recent storms that have affected the area. First was Winter Storm Riley, then Winter Storm Quinn, and ended with Winter Storm Skylar – three powerful storms in 11 days. 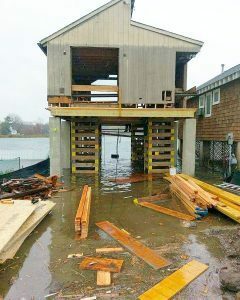 High winds, heavy rain and snow fall, surging waves, high tide, and even a full moon played a part in many homes across the coast of Massachussets, New Hampshire, Rhode Island, Connecticut, and Maine getting flooded. We all know the devastating damage that floods can cause such as mold, rotting – it can also take a toll on the home’s structure and foundation. Flood recovery is an area that Payne Construction specializes in. We can lift your house, raise it above FEMA base flood elevation, install a helical pile foundation, and handle other work necessary to protect it from future storms and flooding hazards. Elevating your home above the base flood elevation can dramatically reduce the cost of your flood insurance premium. You can save hundreds of dollars for every foot the elevated floor is located above your area’s established base flood elevation. 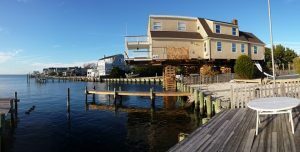 Elevating just one foot above the base flood elevation often results in a 30% reduction in annual premiums, a home with its first floor elevated three feet above the base flood elevation, can expect to save 60% or more on flood insurance premiums. If your home was affected by the recent storms, at risk of coastal flooding, or you are looking to reduce your flood insurance premiums give us call today 800.343.3568. We can provide free estimates, assess the condition of your foundation, and consult with a local engineer to develop the most appropriate and feasible plan of repair or prevention for your home.